The new Samsung Galaxy S3 Mini smartphone offers an interesting mix of ergonomics ease of use and superb features. This Samsung Galaxy S III Mini runs on a powerful Dual-Core Qualcomm MSM8930 1.2GHz processor with 1 GB RAM memory same as the HTC One VX, comes wit a 4-inch Super AMOLED touchscreen display which is the same as its full-sized sibling the Samsung Galaxy S3. The resolution though is kind of lower at 800-by-480 pixel resolution that produces a 233 pixels per inch display. The HTC One VX has a sharper and brighter 960-by-540-pixel LCD display screen. 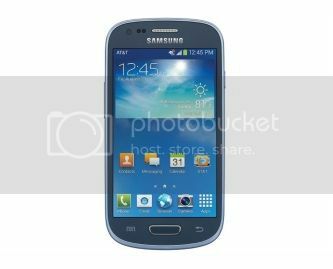 This pebble blue colored Samsung Galaxy S3 mini supports Wi-Fi 802.11b/g/n Wi-Fi on both 2.4 and 5GHz bands, Bluetooth 4.0 access, Quad-band GSM/GPRS/EDGE (850/900/1800/1900MHz), UMTS (850/1900/2100MHz), HSPA+ 14.4, 4G LTEGPS, and GPS technology. This S3 mini model Samsung Galaxy smartphone features Jawbone Era Bluetooth headset, voice dialing, microSD card slot. The S III mini battery power last at about 12.5 hours which is slightly lower than HTC One VX’s 14.5 hours of battery usage. Retail price is $399. This Samsung Galaxy S III Mini smartphone running on Android 4.2.2 OS also uses a 5 Megapixel Rear Camera that produces acceptable shots at both good and low-light conditions. this Samsung Galaxy mobile phone supports playback of all standard music files such as FLAC, WAV, & OGG and plays video files like H.264, MPEG4, AVI, and Xvid files at up to 1080p resolution. The S3 mini is a reasonably affordable miniaturization of the highly innovative Samsung Galaxy S3. Samsung Galaxy S5 versus Sony Xperia Z2 – What’s your Choice?